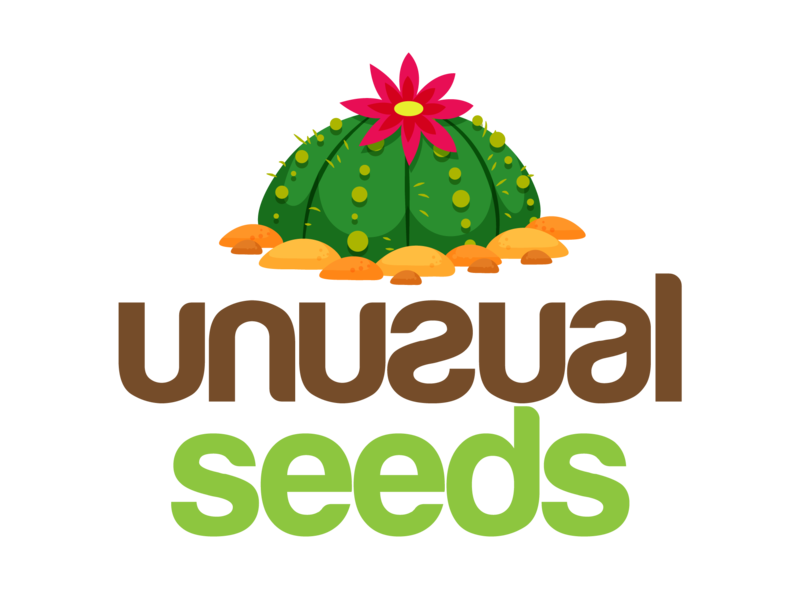 Before planting Pachypodium, you need to soak the seeds in the water with a temperature of 86°F (30°C). Keep them in water for about 3 hours. The best indicator that the seeds are ready for planting is when most of the seeds sink to the bottom. It’s desirable that the water you soak the seeds in is not chlorinated. Substrate for germination needs to contain Cactus soil, sand and pebbles (perlite or pieces of brick). Sterilize all the ingredients in a microwave for 3 minutes or in the oven for about 45 minutes on 350°F (180°C). Cool the substrate. You can use fungicide for the sterilization too. Containers for planting should be deep about 2 inches (5cm). It’s important never to fill them to top, but leave free space of at least half an inch (1 cm). In one container, 2×2 inches (4x4cm) there can be 8 seeds. Spread a layer of pebbles over the bottom of the container, because it will facilitate the drainage of water surplus. Then pour a layer of Cactus soil, and spray it with a sprayer (you need to see the water coming out of the bottom of the container). Afterwards, add a layer of sand and water it again. You can lay the seed over this layer, it’s just important that it’s put horizontally. You will cover the seed with another thin layer of sand, 0.12-0.20 inches (3-5mm). And then water the sand with a sprayer again. Cover the container with a transparent foil, bag, glass or something similar, so that the moisture will stay in this container, which is extremely important for germination. Pick a spot with temperature of 65-75°F (20 i 25°C), well-lit, but don’t expose your plant to direct sunlight. Germination can start as soon as 5 days after planting, but that can take more time to happen. When most part of the seeds germinates, remove the foil with which you kept the plant moisturized. Maintain the substrate moist for seedlings and keep them away from direct sunlight for a couple of months. Young plants will grow relatively fast. When they reach the height of about 1 inch (3cm), you can repot them into individual pots making them the same soil combination you did for planting. 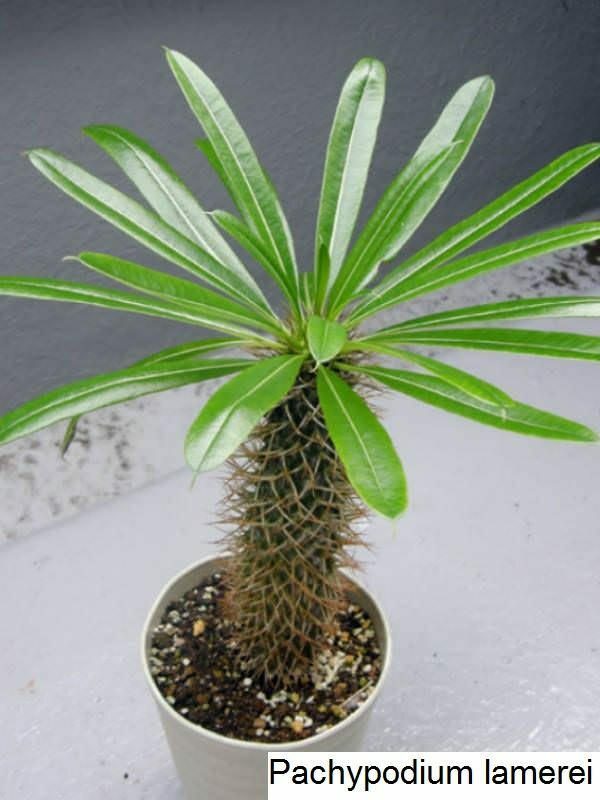 Place: Mature Pachypodium can endure strong, summer sunshine. However, you need to gradually adjust it to it so it doesn’t get burned and starts shedding leaves. You need to find a well-lit spot in the garden or terrace for it, and during winter it needs to be in the house. Substrate: This plant grows on a poor, sandy soil in nature, so you need to provide it with similar conditions. The best mixture is the one you can find in a Cactus mix, with an addition of another layer of sand on the surface. In order to improve the substrate drainage, add some perlite or pebbles or something else. The root of this plant doesn’t stand to be wet for a longer period of time, so it’s necessary to make sure that the water flow through the substrate easily. Repotting: These plants can be repotted in spring, when the sunlight during the day last s for at least 12 hours. During that occasion, you should pick a bit bigger pot than the last one. Be careful to repot the plant on the same high it was before. Watering: Watering rules are the same ones that apply to Cacti and other plants with Caudex. It needs to be watered more in quantity, and there is applied a rule: water with more water, less often. Be sure to wait that the soil is dried since the last watering. You shouldn’t leave water in the pad under no circumstances. During winter, watering is decreased to a minimum, but you need to follow the state of the plant and decide if it’s thirsty or not. Wintering: This plant is not cold-resistant and it’s necessary to put it away as soon as the temperature drops below 50°F (10°C). It should spend its winter in a warm room, but as far as possible from the heat source. The ideal place would be an east window. The ideal spot is a window facing east. If you can’t grant it these conditions, you can put it in an unheated room, but then you need to stop watering it until spring, only 1 watering in a cold room can be fatal. During winter, most of the plants shed their leaves, and that happens to plants left in a cold room and less frequently to those that were in a warm room. That’s a normal thing; they get their old appearance in spring. Be sure to provide plenty of light to the plant, so it doesn’t deform.